Wormulon is the home planet of the intelligent species of slug-like creatures that produce the best selling beverage in the galaxy: Slurm. 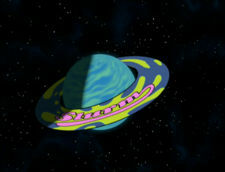 The planet has a ring system similar to Saturn's, but it has been manipulated to display a Slurm logo. The planet is known to be inhabited by two races: the Worms themselves, including spokesworm Slurms MacKenzie, and a race of small, orange indentured servants called Grunka Lunkas who work at the Slurm Factory. This page was last edited on 5 December 2014, at 23:46.